Maryland adopted the Renewable Energy Portfolio Standard (RPS) in 2004. The implementation of this program is accomplished through the creation, transfer, and retirement of renewable energy credits (RECs). A REC is a commodity that represents the renewable attributes associated with the production of one megawatt-hour of electricity generated using eligible renewable energy sources. To comply with Maryland’s RPS program, an electricity supplier must demonstrate, in annual reports filed with the Maryland Public Service Commission, the retirement of an amount of RECs in proportion to the supplier’s total share of Maryland’s electricity supply. For example, in 2015 a supplier was required to prove that it retired the number of RECs that was equivalent to 13.0% of the total electricity that it supplied to customers in the state—10.0% from Tier 1 non-solar resources, 0.5% from Tier 1 solar resources, and 2.5% from Tier 2 resources. Each year, suppliers must retire a greater number of RECs to comply with the escalating requirements of the RPS. At the same time that RPS requirements were increasing, the price of Tier 1 non-solar RECs rose steadily as well. In 2010, the average price of a Tier 1 non-solar REC was $0.99. In 2015, the average price paid for a Tier 1 non-solar REC surged to $13.87—an increase of over 1,300%. 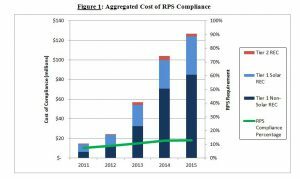 As a result of the increases in RPS requirements and the price of Tier 1 non-solar RECs, the cost of compliance with the Maryland RPS program has increased exponentially. As illustrated in Figure 1 above, the aggregated cost of compliance in 2011 was approximately $14.7 million. In 2015, the last year for which data is available, the aggregated cost of compliance swelled to $126.7 million. In addition to the steep growth in the aggregated cost of compliance with Maryland’s RPS program, it is important to note that data suggests that a significant portion of this cost is paid for RECs generated out-of-state. While a primary objective of the RPS was to foster the development of renewable energy resources in Maryland, this goal has largely not been borne out. As shown in Figure 2, Tier 1 non-solar generators produced fewer than 760,000 RECs in 2011. In 2015, generators in Maryland produced approximately 1.3 million Tier 1 non-solar RECs. While it might appear that there was a significant addition of Tier 1 non-solar facilities between years 2011 and 2012, it was actually a reclassification of certain technologies, namely municipal solid waste, which led to the illusory increase—not the development of new generation sources. 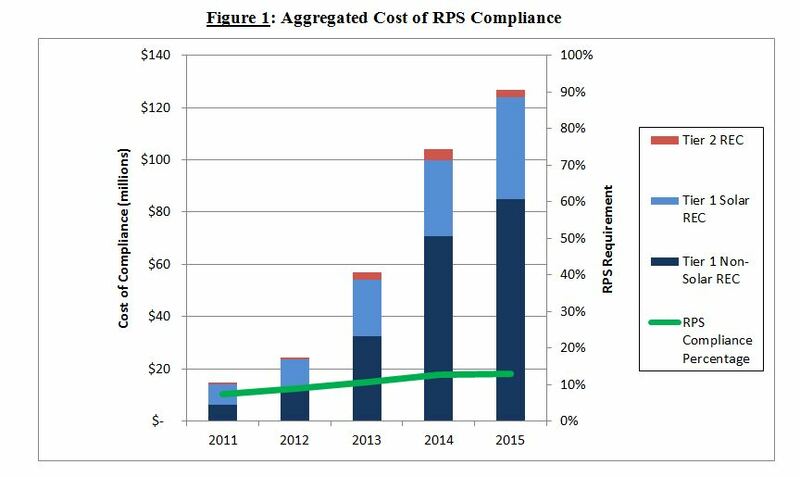 Accordingly, every year, electricity suppliers in Maryland purchased greater numbers of out-of-state RECs to comply with the RPS. The Maryland Energy Administration (MEA) estimates that in 2015, Maryland ratepayers paid more than $76 million for RECs that were generated out-of-state. Across the life of the Maryland RPS, MEA estimates that as much as $186 million, if not more, has been spent to acquire non-Maryland RECs. Maryland is at a critical juncture with regard to the state’s RPS program. Renewable resource developers in Maryland have not demonstrated an ability to accommodate the current requirements of the RPS. Electricity suppliers have relied heavily, and will continue to rely heavily, on out-of-state generators to acquire the RECs needed for RPS compliance. In fact, in every year since 2011, between 70% and 75% of RECs retired for compliance were generated out-of-state. Renewable energy resources play an important role in Maryland’s future, and the future of our country. However, Maryland should undertake a measured approach to their implementation. Any further increase to the RPS will do little more than accelerate the export of tens of millions of additional ratepayer dollars out-of-state.